Water based and quick drying, touch dry in 30 minutes, re-coatable in 2 hours. Provides a tough and durable satin finish on all interior woodwork. Approx coverage 13-15m2 per litre. 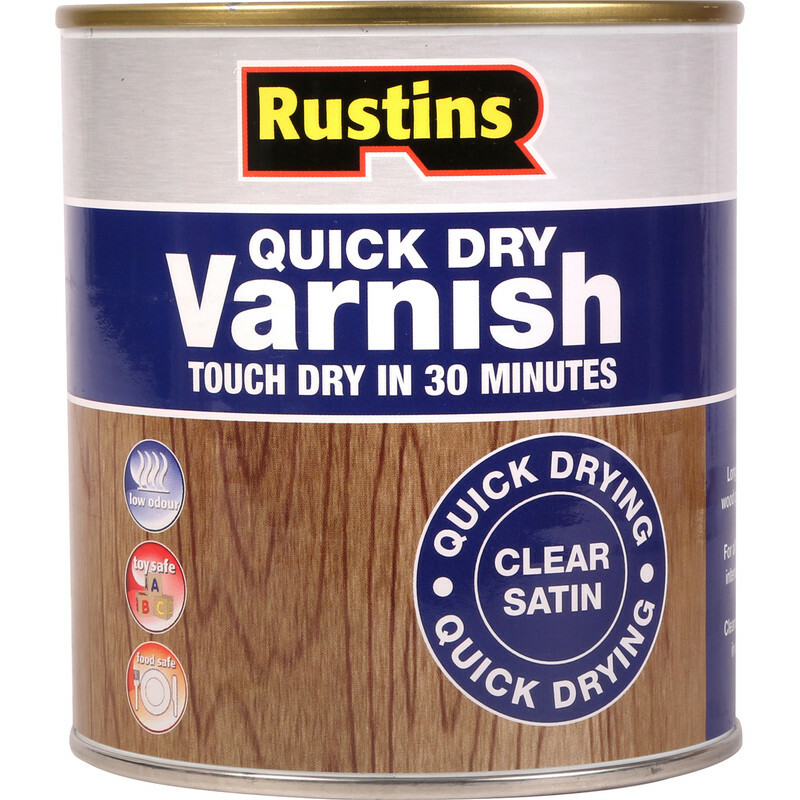 Rustins Quick Dry Varnish Satin Clear 500ml is rated 4.6 out of 5 by 27. Rated 4 out of 5 by Matts your man from Very user friendly It's water based and doesn't smell overpoweringly. However you do need to layer on at least three coats to make it effective. Rated 5 out of 5 by Phil already used from Decent Varnish Gives a lovely finish to oak handrail and spindles that has lasted well. Required 2-3 thin coats, but dries nice and quick. Rated 5 out of 5 by Steve70 from Dries to a hard satin finish Varnished table with another popular brand and the finish was bad and never really properly hardened. Sanded table again and used Rustin's, wow what a difference. This is excellent quick drying vainish, a much better finish and dries hard as expected. Rated 5 out of 5 by PhilRP from Varnish with a good finish Used on a set of 5 oak doors, quick and easy to apply although don't use it if the temperature is above 21c as it goes sticky. 2 coats and then a light sanding gave a excellent finish that matched the spay finish on the other oak doors in the house. Last point bushes wash out in water, great. Rated 5 out of 5 by Johnnyboy55 from Great product. Use this quite a lot, keeps its look, good hard finish. Brush cleaning very easy. Rated 5 out of 5 by Flitter from super quick drying, easy to use Dries within minutes.making it very easy to use and gives a good matt finish.